I have always been a fan of crumpets. However, it wasn’t until Mum and I ordered some at the Harrods Tea Room that I considered that they weren’t just available from a packet. Mum and I had been from Regent Street to Westminster to Covent Garden that day, and after a big lunch at Jamie Oliver’s Union Jacks restaurant in Covent Garden, we were seeking something light and comforting by the evening. Whilst waiting in the line to get a table at the Tea Room, I considered just getting a pot of tea and something small to eat. I couldn’t go past another pot of tea, especially when the selection of teas at Harrods are so good. Once we were seated, Mum looked over at a table near us and noticed that someone was eating crumpets. Despite it being about 7pm, she exclaimed, ‘That’s it, thats what I am having!’. I quickly looked at the menu and saw they served breakfast all day. I couldn’t believe our luck, this was exactly what we felt like eating! 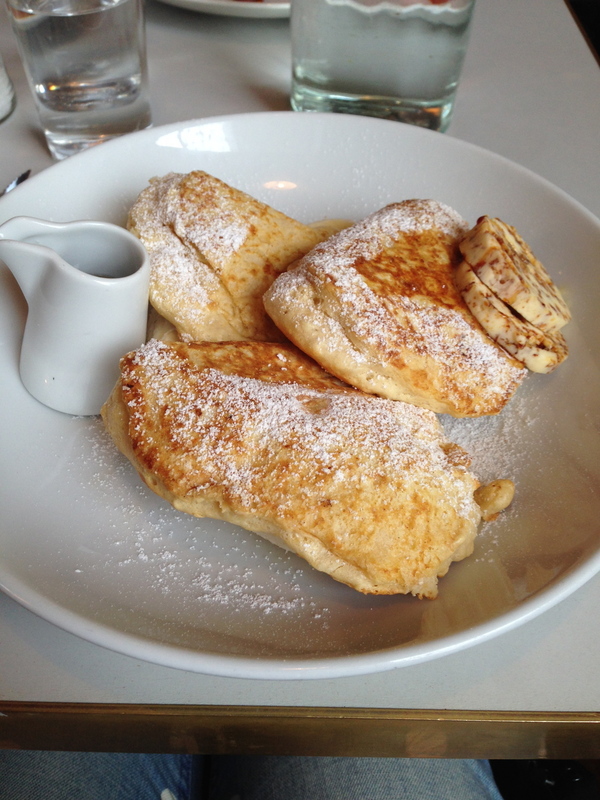 When our order arrived, the crumpets were under a silver dome to keep them warm. The effect was good, as it made me feel not only very British, but like I had ordered something rather special! Coupled with butter, jam and very nice tea, the crumpets were the best thing ever. It sounds silly that something so simple could be so good, but they tasted so much better than the crumpets from a packet we have at home. This naturally got me thinking. Was it possible to make crumpets from scratch? 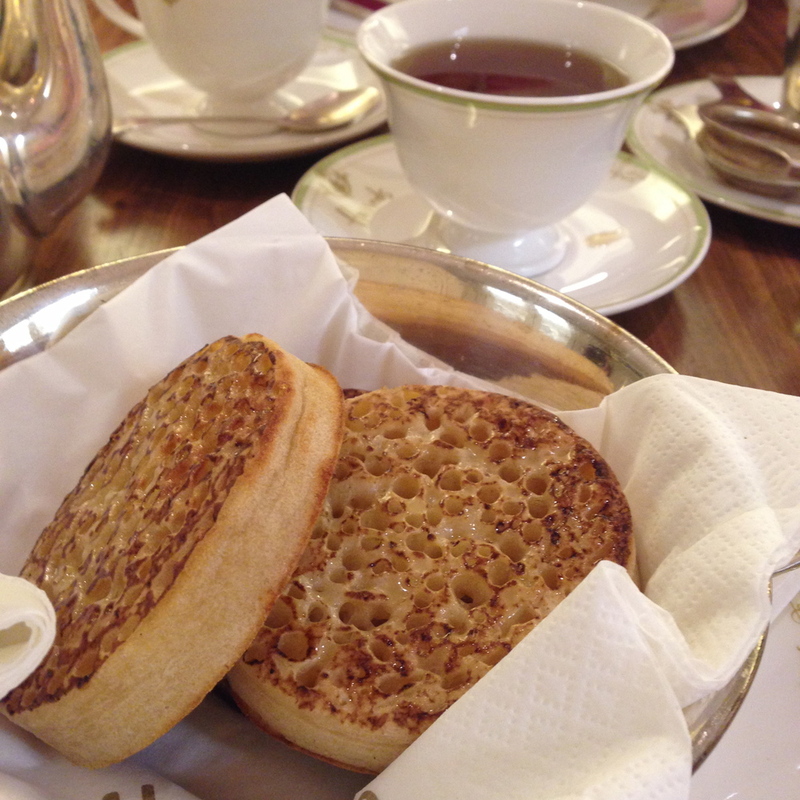 Crumpets & Tea at the Harrods Tea Room. Heat the milk in a saucepan until it is just warm then remove from the heat. Transfer to a bowl and add the yeast and sugar and stir a little. Leave to stand for about ten minutes, or until the mixture starts to bubble and is a little frothy. Sift the flour and salt into a bowl and make a well in the centre. Gradually add the milk and beat using an electric mixer until the batter is smooth. Cover with plastic wrap and leave in a warm place for 1 - 1.5 hours or until doubled in size and has lots of air bubbles. I used my oven to prove this batter. Turn the oven on to 100 degrees and once it has reached the temperature, turn the oven off. Place batter inside oven, with the door propped open, until the temperature has lessened (maybe after 30 mins), then close the door for the remaining proving time. Make sure the bowl you use is heat proof (e.g. glass) and the plastic wrap doesn’t touch the oven, only the top part of the bowl. Whilst the batter is proving, place the raspberries, sugar and lemon juice in a saucepan over high heat and bring to the boil. Reduce the heat and allow to simmer for about 5 minutes, or until the mixture is syrupy. Remove from the heat and allow to cool. Place the butter in a bowl and whip with a wooden spoon until it is light. Once the raspberry syrup is completely cool, fold it through the butter creating a ripple effect. Transfer to ramekin or butter dish and store in the fridge until needed. Once the crumpet batter has doubled in size, mix the bicarb soda with the water and then add to the batter using an electric mixer. Heat a fry pan and grease with butter, and greasean 7-8cm egg ring with butter. The cooking process is quite slow, so if you have multiple eggs rings and a larger pan cook multiple crumpets at once. Place the egg ring/s into the pan and place about 2-3 tablespoons of the mixture in to each ring. Don’t overfill them as the mixture will rise and spill over the edges. Cook over a low heat for about 5 minutes, or until the top surface is full of bubbles and the crumpet has formed a skin. I found this process took longer than 5 minutes, but it will probably depend on how even your stovetop distributes heat, and how consistent it is. Once bubbles and a skin have formed, loosen the egg rings on each crumpet and turn over to cook the other side. Place cooked crumpets on a wire rack with a tea towel covering them whilst cooking the remainder of the batter. Remove the raspberry butter from the fridge, and if crumpets have remained warm serve immediately with the butter. If they have cooled down, or you are serving them at another time, briefly warm them under a grill or in a toaster. Raspberry butter is best served slightly softened. 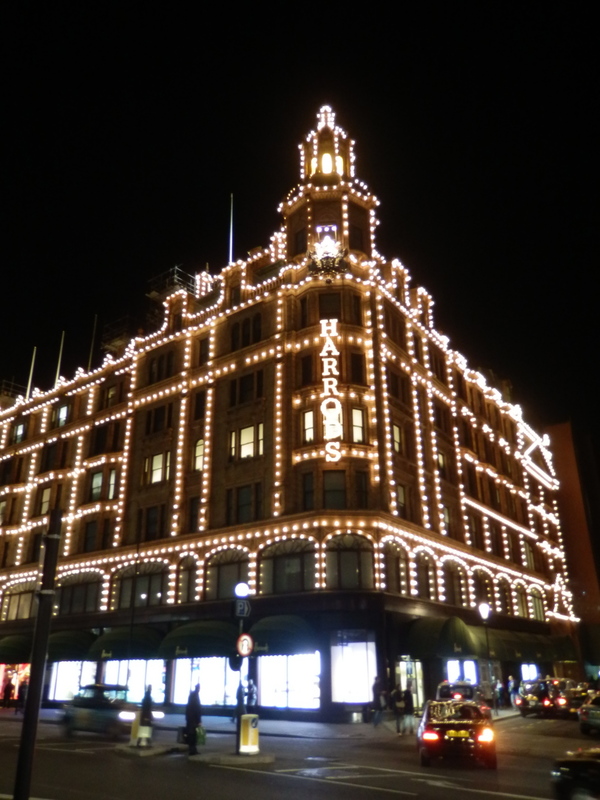 Harrods Tea Room can be found on the second floor, Harrods 87-135 Brompton Road Knightsbridge, London. Original recipe from ‘bills Sydney Food’ by Bill Granger (2000), page 57. Originally Posted May 1, 2014. NOTE: Click here for a more recent post on Fortnum & Mason's Rose Biscuits + How to Make Crystallised Rose Petals. The recipe in this more recent post replicates these biscuits in a truer way than the version in this post - Kath, 25/4/16. The first time I went to Fortnum and Mason, I was 18, not into tea and really had no idea. What a shame. All I remember seeing is the bluey-green of the interior and thinking, ‘So the Royals buy their food here?’ Luckily things have changed. 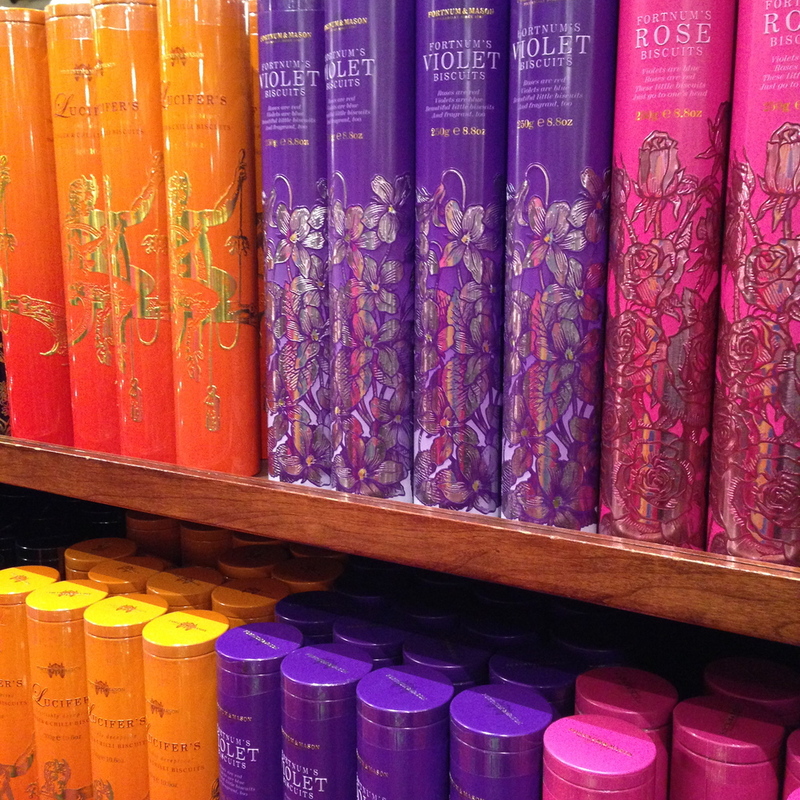 My next encounter with Fortnum and Mason was with their Rose Shortbread, in a lovely pink cylindrical tin. Of course, it was the tin that attracted my attention first. Anyone who knows me knows that I am drawn to pink. I can’t help it. The biscuits ended up being beautiful too, so it was a win win really. Later, I found a book by Fortnum and Mason about Tea which had a biscuit recipe for rose biscuits that, I hoped would be the same as the ones that came in the pretty pink tins. Unfortunately, I had the book for a few years and never tried it. Mostly because the recipe called for crystallised rose petals and golden caster sugar. The first seemed to be basically unheard of in Australia and I was just plain confused by the second. I gave up. Display of Fortnum & Mason's wonderful biscuits in their London shop. When we decided we were going to London, I decided I was not going to miss out on Fortnum and Mason. And I certainly did not. Mum and I ended up going there three separate times! We had tea and scones in The Parlour, looked around the shop, including their great baking section, and admired the lovely tea sets for sale. On another visit I bought tea, and on the third I was so hungry I just had to try their macarons. I tried salted caramel, red velvet and Neapolitan. All were brilliant. Tea & Scones at the Parlour in Fortnum & Mason London. Salted Caramel, Red Velvet & Neapolitan Macarons from Fortnum & Mason, London. After a few weeks back at home, I re-opened the ‘Tea’ book from Fortnum and Mason. I decided that I was going to make these rose biscuits and unavailable and unheard of ingredients were not going to stop me. Unfortunately, crystallised rose petals still seem to be unheard of in Australia. Fortunately however, ‘golden caster sugar’ is now available in Australia, so after a little experimentation I have settled on this adaption of the original Fortnum and Mason recipe. I have iced them with a rose icing as the extra subtle hit of rose makes up for the crystallised rose petals. Preheat oven to 180 degrees Celsius, and line two baking trays with baking paper. In a large bowl, cream butter, sugar and rosewater until all combined. Add the sifted flour and almond meal and mix until combined. Cook for 15-20 minutes, or until slightly golden. Cool biscuits on the trays or on a wire rack. Once the biscuits are cool, place the sifted icing sugar in a medium bowl. Add the boiling water, one tablespoon at a time, mixing well. Then add the rosewater. Add as much or as little as you like, but I found that 3 teaspoons had a nice scent of rose without being overpowering. Once all the liquids are added, check the consistency of the icing. It needs to be a smooth paste. If it is too runny it will run down the sides of the biscuits. Add more sifted icing sugar, in small increments, if the icing is too runny. If the icing is to thick, add more boiling water in small increments. Once you have the right consistency, add a small amount of pink food colouring. I use gel colours, and don’t have to use very much to achieve a nice light pink colour. If using traditional food colours that are more fluid, add tiny amounts until you have a nice light pink colour. It won’t take much colouring to get a light pink. Add a litttle more sifted icing sugar/boiling water if the food colour has changed the consistency of the icing. Once you have the desired colour and consistency for the icing, spread small amounts on the top of each biscuit. The icing will take at least a couple of hours to dry completely, but they are great to eat even if the icing hasn’t dried. Makes 36-38 biscuits. Store in a airtight container. *‘golden caster sugar’ may be labelled as ‘raw caster sugar’ in Australian supermarkets. However, the UK sugar manufacturer ‘Billington’s’ is available in Thomas Dux stores, Essential Ingredient and Woolworths stores. Billington’s has a range of sugars including ‘golden caster sugar’ and ‘muscovado’ sugars. Recipe adapted from ‘Tea at Fortnum and Mason’ p.61 (Ebury Press). Fortnum and Mason can be found at 181 Piccadilly, London. Originally Posted March 25, 2014.